When my daughter was born on a snowy December night, I was overwhelmed with love. I remember cuddling with her as my husband and I listened to Christmas music. We found an ornament in the hospital gift shop with her name on it. We dined on a Christmas dinner that year that someone else prepared. Having a baby in December? It was better than I expected. Fast forward 10 years and seven birthday parties later. December birthdays can be sweet, but they can be hard when it comes to throwing birthday parties. 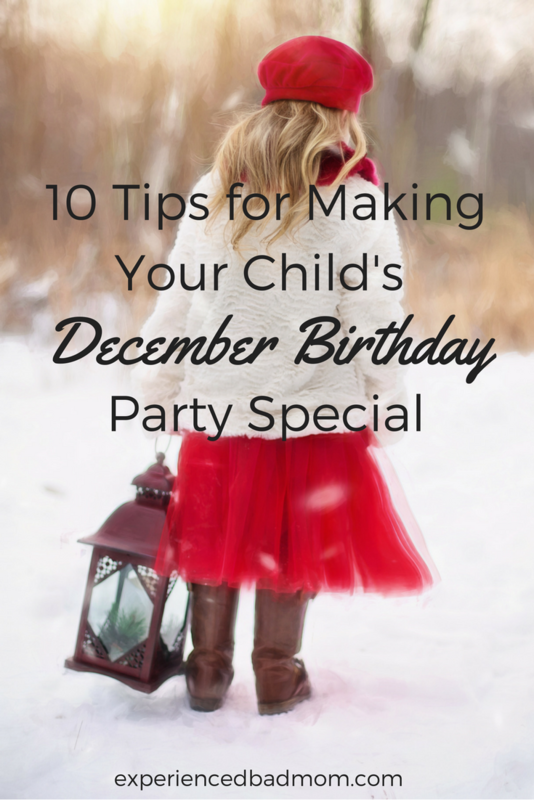 Luckily, I have years of experience and 10 tips to share that will make your child’s next birthday party during the holidays as fun and stress-free as possible. Plan in advance. Everyone is busy during the holidays. There are gifts to buy, parties to attend, and special activities at school. I recommend picking a date for your party a month ahead of time, if possible. Be flexible with your date. Every year, our town hosts a holiday parade on the Saturday closest to my daughter’s birthday. Everyone goes, so we usually have her party the following weekend to avoid competing. Consider piggybacking on a special event. Once we took my daughter and her friends to a trick-or-treat with Santa event. Children visited businesses in a shopping center collecting candy or toys before visiting with Santa. The treats served as their goody bags (bonus!) and afterwards we celebrated with cake at our house. That party was one of the easiest and most fun we’ve had. Think right before or after the holidays. I have found that if you can wait until the weekend before Christmas kids are ready to attend a birthday party. By then, they’ve already visited Santa, had their school party, performed in the holiday play, etc. Same goes with right after New Years. All the holiday excitement is gone and kids are bored–and available. Skip the week between Christmas and New Years. Not only is it Kwanzaa, but people are traveling or entertaining relatives then. Prepare your child that not everyone can come. One year a friend couldn’t come because she was celebrating the holidays with her grandma early. However, it’s no different from at other times of the year. My oldest child has a summer birthday and someone is always on vacation. Go full-out birthday party mode. Yes, Christmas music blares from every stereo and the stores offer gifts galore for Hanukah’s eight nights. That makes it even more important to celebrate with a standard birthday cake and typical birthday party decorations. Someone may double-up on a birthday/holiday gift. Most kids don’t do this. Usually, the two-for-one gift is from a relative. It’s not the end of the world. Give yourself a pep-talk. I’m not going to lie. Planning and throwing a birthday party during the holidays amidst all the other things you have to do is hard. But, we are moms. We are nothing if not strong! Throwing a birthday party during the holidays? It can be done. And, if you keep these tips in mind, it can be a happy birthday indeed. My daughter’s birthday is in early January and the party I remember most is the one we held in December! A dear friend of hers was moving back to Australia and my daughter wanted to include her before she left. We held it a week before Christmas at Burnaby Village, largely because of the vintage carousel. Everyone had a hoot. School was out, everyone was in a festive mood and the carousel rides were endless. I was tempted to make it an annual event … ! Yes, it can be great fun to celebrate a birthday during the holidays. Everyone and everything is extra festive! Oh my goodness, I can’t even imagine adding a birthday to the already crazy month of December. I love your idea #3. We might be doing that again this year. It works great and everyone’s happy! Haha! Amen on number 9. Kid birthday planning no matter the time of year is not for the faint of heart. Jen recently posted…How To Stay Hydrated, Manage Aches and Pains & Sleep Better! Absolutely! My son’s summer birthday could be just as stressful when he was little and all his buddies were on vacation. Katy, these are such helpful tips. My nephew’s birthday is in December, and I *almost* forget it every damn year. UGH! I feel awful and I am JUST remembering it as I write this…. Off to text my SIL about his gift wishlist now. Hang in there mama. You totally got this. To add to the fun, *my* birthday is in December, too! That which does not kill me makes me stronger, LOL! My brother and sister both have December birthdays. We always tried our hardest to make them feel special on their birthdays, but it can definitely be difficult. Thanks so much for sharing these tips and thanks so much for sharing at the #happynowlinkup! It’s a challenge, for sure. But Moms are pretty much wonder women so we can do it! There really isn’t an ideal time for a birthday party, as far as I’m concerned. BUT Christmastime is especially challenging! We’ve got it more complicated here due to the Thanksgiving holiday, too, a month before. Basically the 4 weeks in between the 2 holidays are booked, booked, and booked.